1We would like to thank Lisbet’s father, Hans Rausing, whose exceptional capability and great generosity enabled us to fund the Endangered Archives Programme and contribute to the preservation of vulnerable archival collections worldwide. 2The keepers of fragile, at-risk archives often do not have the means of preserving them. Faced with conflicts and their aftermath, natural disasters and epidemics, not even governments can afford to secure the survival of their archival heritage. And what of archives in private possession or those in small, struggling institutions? What of the heritage of minorities, whose position may be precarious in any case? What of the heritage of the displaced and the exiled whose archives are no longer understood or seen as relevant by the communities who keep them? It is easy to condemn neglect, but these communities often struggle to preserve their own heritage, let alone the heritage of others that came to them through accidents of history. We cannot expect them to shoulder the burden alone. 3Endangered archives are scattered throughout the globe, often unknown or inaccessible. Ensuring that help reaches where it is most urgently needed may be a complex matter. This is why we decided to establish a grant programme allowing those who know of archives in danger to apply for support to digitise them. We chose digitisation because it preserves the content of the archives, even if the physical materials may disappear in the future. Importantly, it enables access to the documents without the need for physical handling that might cause further deterioration. 4Access to the materials must be a crucial part of any effort to safeguard the knowledge and memory they contain. Minorities, exiles, the displaced and various first nations who have often been denied access to their own heritage as a result struggle to maintain their cultural identity. Who could lay claim to rescuing their heritage if we digitise it without making it accessible to them? And we do mean accessible – not only to those who can afford the travel to London but to every member of any dispersed community and to anyone who wants to explore and understand their culture. Digitisation may help to preserve the archives, but without open access the impact of these efforts will be limited. 5The digitised collections contain a wealth of historical knowledge. They may not be part of school curricula or learned canons, but it is not for us to decide whether they do or do not become part of them in the future. Simply put: if this is the memory of the world, the world needs to be able to access it. We are proud that ten years from its inception, the Endangered Archives Programme has made nearly four million files available through its website. These are nearly four million individual windows into the human past that might otherwise have remained inaccessible or could even have closed forever. 6Much of the credit for the wonderful success of the programme should go to the British Library and the programme’s team. Their tireless enthusiasm and dedication made it possible to transform the concept into an efficient reality. The global reach and significance of the programme would have been impossible to achieve without the international panel of experts who, over the years, have generously shared their knowledge and assiduously scrutinised applications, making sure that the support is directed where it is most needed. The expertise of the British Library curators helps to ensure that, what could have so easily have become a Borghesian labyrinth, is an accessible and clear archive of archives. We are also grateful to the Advisory Board and to the staff of the Arcadia Fund for their unflinching support, advice and hard work. Most importantly, however, our recognition is due to grantees who took risks and often worked in harsh conditions to ensure that historical materials were preserved. They are the real heroes of the Endangered Archives Programme. 7We are grateful to the British Library for agreeing to keep the collections in perpetuity and ensuring that they remain freely accessible. We hope that not all scholarly publications based on these materials will be closed behind paywalls. RAUSING, Lisbet ; BALDWIN, Peter. 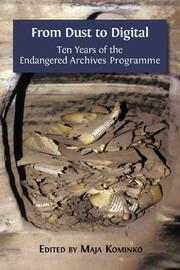 Introduction In : From Dust to Digital : Ten Years of the Endangered Archives Programme [en ligne]. Cambridge : Open Book Publishers, 2015 (généré le 26 avril 2019). Disponible sur Internet : <http://books.openedition.org/obp/2208?nomobile=1>. ISBN : 9782821876262. Rausing, Lisbet, et Peter Baldwin. “Introduction”. Kominko, Maja. From Dust to Digital : Ten Years of the Endangered Archives Programme. Cambridge : Open Book Publishers, 2015. (pp. XXXVII-XXXVIII) Web. <http://books.openedition.org/obp/2208?nomobile=1>.